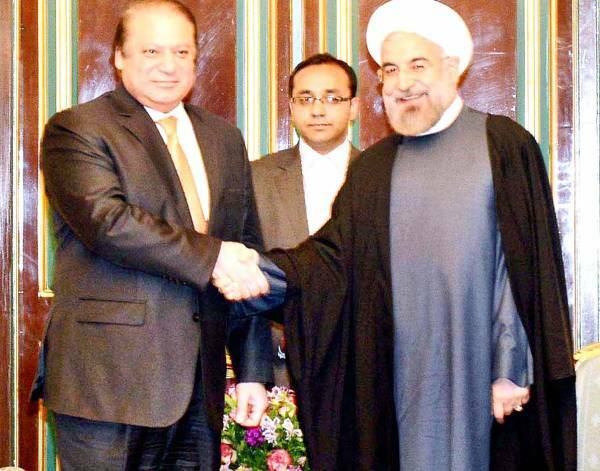 Prime Minister Nawaz Sharif and Iranian President Hassan Rouhani have agreed to continue with the Iran-Pakistan gas pipeline project. The PM informed the Iranian President that he was there with his team of finance, petroleum and interior to resolve all the matters, which were creating hindrance in the project. A statement from the PM House said both the leaders reiterated their commitment to enhance the bilateral trade between the two countries during the meeting held at Saadabad Palace. Prime Minister Nawaz Sharif said there was a lot of scope of increasing the trade volume and they wanted to enhance it to new levels of $5 billion. He said Pakistan-Iran relations were bound by historical and religious linkages. President Rouhani said Iran-Pakistan relations had historical connections. Apart from being neighbouring countries, both the Muslim countries had the common traditions and relations based on the Holy Quran and the traditions of the Holy Prophet (PBUH), he added. Prime Minister Nawaz Sharif’s visit would further boost the brotherly relations between the two countries, he said. Affairs Sartaj Aziz and Special Assistant to PM Tariq Fatimi were also present during the meeting. The Prime Minister told the President that some miscreant elements were trying to sabotage the brotherly relations between Pakistan and Iran. They would deal with all such elements firmly and would not let them sabotage these relations, he added. Prime Minister Nawaz Sharif said, “We want security for development and development for security”. President Rouhani also affirmed his government’s support, saying that peace in the region was their common goal. He said they would support Pakistan to develop and become more secure. Both the leaders also discussed the border security matters between the two countries. They agreed that better border management and improved security measures would result in increased bilateral trade and strengthening relationship and cooperation between the two countries.